ABCNews is reporting on "Animal Kingdom Odd Couples" today. Many more when you jump over there. Here, a little macaque monkeh nestles its head on a pigeon on Neilingding Island, China. Next up, a dog feeds two tiger cubs at the Changchun Zoo in Changchun, China. The dog fed the cubs when the mother of the cubs failed to feed the newborn tigers after giving birth. D'oh! 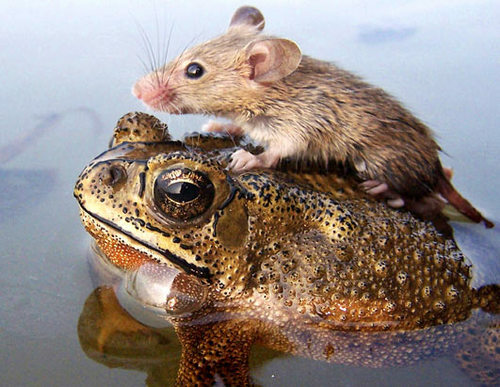 A mouse rides on the back of a frog in floodwaters in the northern Indian city Lucknow. Entrepreneurial! Joost S., it is an overload over there, you're right. Jeeshe. Snorglethons are my bleening favorite! Oh wow... I think the dog thinks the tiger cubs are "really big tabby kittens". Lookit the little monkeeee. Sigh. I jumped. I saw. I melted. 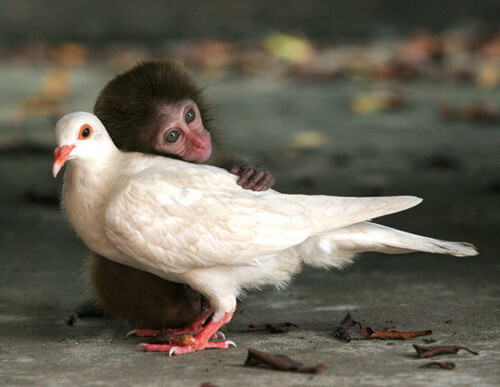 The little macaque with the bird melts the heart. Poor little monkeh! The orangutan with the baby tiger is cute too. So affectionate! But the cat being carried by the dog? Hahahahaha! That is hilarious. That photo needs a caption. And that cat seriously disapproves! WOW! What is with all the [big] felines rejecting their kittehs, and the canines steppin' up to pick up the slack?!? Those poor cubs are going to have a honkin' case of Ego-Dystonic Species Identity Disorder [DSM VI]. In the on-going cats-vs-dogs war, I fear the dogs are gaining an undue leverage. What's next--feline parenting classes taught by Boston Terriers!?!?! Geesh! I think the cat being carried by the police dog looks like a perp or at least a juvenile delinquent!! My fave is the pigeon with monkey! Ah, that we could all put aside our differences!!! Tiger cub: "My mommy doesn't want me..."
Orang: "I know, sweetie, I've been there... I'll take care of you." As amusing as the other pictures are, can anything else top the love that monkey shows for his pigeon? I think not. That macaque pic is the epitome of innocence. That's right. I said epitome. Animals are caring entities. When one of my mother cats was run over...long story...my other 2 mother cats raised her kittens. (I used to breed Rag Dolls) Now I only have the love of my life Nik-Nik...it takes a lot of energy to breed and take care of many cats. I love Rag Dolls. Is there anything sweeter than a happy mamma dog? Meg, I can't believe you didn't post the pic of the kitteh being carried by the German Shepherd. That is some SERIOUS kitteh disapproval, right there! I understand tho...all the pics bring on the head tilt/awwwww combo! Yep, it's an oft-used line here, but that doesn't make it any less usable. Linda SF: Which axis would that belong to? We need to get those tiger moms on Jerry Springer. They'd be all "You don't know me! You don't KNOW ME! SHUT UP!" The top picture is my computer wallpaper. I think the backstory is that the monkey was orphaned and dying of grief, and the dove (?) stepped up and started nurturing it. It saved the monkey's life and now they are inseparable. Yet another example of how we little we know of the emotional and intellectual capabilities of animals. Please, folks, stand up for the animals however you can! And they called it Monkey Loooove! Just because we're not the same. I guess they'll never Knooowowo. That our love just can't be tamed! that they may rain on the earth. Looks like froggy went a-courtin'. Go Miss Mousy! Totalee Puppy, that is awesome! The photos of the animals are truly awe-inspiring. I also think it's noteworthy that in some cases our own species, which normally is pretty crappy about this sort of thing, is facilitating the adoption process. So, we not only recognize, but sometimes enable the cute. Think about it, won't you? Totalee Puppy - I think it is in part due to the fact that I just watched the raccoon video but your poem too brought tears to my eyes. In a good way, tho! The pissed off kitty being carried by the police dog is hiLARious!! Then, I clicked the arrow and found the iguana surfing on the manta ray and nearly fell out of my chair. I think I died of all of the ridiculous cuteness. Manta rays are awesome! All the pictures totalee awwsome squeesome. *melts* I'm feeling all warm and fuzzy inside now. PS, did you see the tiger cub being snurfed by the leetle pink piglet? That was the WTF-est face I've ever seen! These pictures are amazing! 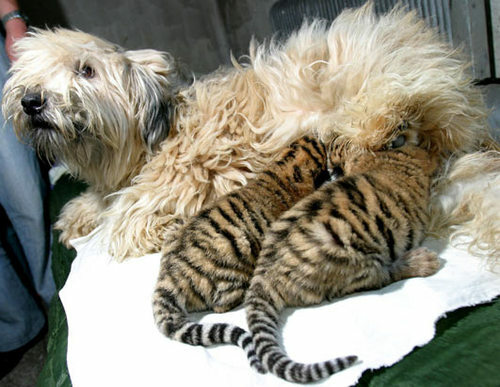 Looks like a Wheaten terrier nursing those tiger babies. Poor babies! Brave doggie!!! The poor macaque and the pigeon - what a face on that little monkey!! Lovely! But you could have chosen some that are not ALREADY on CO.....especially the German Shepherd carrying the obviously unhappy cat - the best of the lot! We have that first one already! Its still cute though. I love this pigeon soooo much." YaY! wmannis used Batrachomyomachia! It was just at the tip of my tongue. Yeah, sure, it was. We are an eclectic bunch, aren't we?! I used an interrobang! I'll stop now, there is just tooo much cute floating around me now. I'm going to have an English muffin and let it wear off a bit. Maybe glass of chocolate almond milk, too-thith is theriouth. So HOW FREEKING COOL IS THAT!!!! The rest of the pics are awesome too! The brilliant green of the iguana is simply beautiful. The monkey makes me sad. Where is his mama?